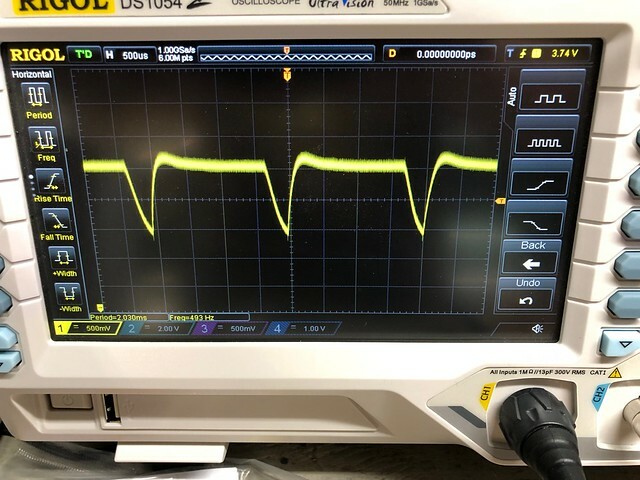 PWM diode "whines" when not at 100%. Will this shorten life? I'm building a labby using a BlackBuck 8 driver and the new NUBM47 diodes from DTR. I want to control the power output and I'm experimenting with both an analog control voltage on the BlackBuck and using PWM from an Arduino. Using PWM would give me a lot more flexibility, but when the laser is not running at 100% there is an audible whine from the diode. I have not brought this up to full current yet - still running about an amp. Will this shorten the life of the diode? Does anyone know if it would be safe to the driver to smooth it out with a filter capacitor? Thanks. Really excited for what I have cookin', but I don't want to break it. 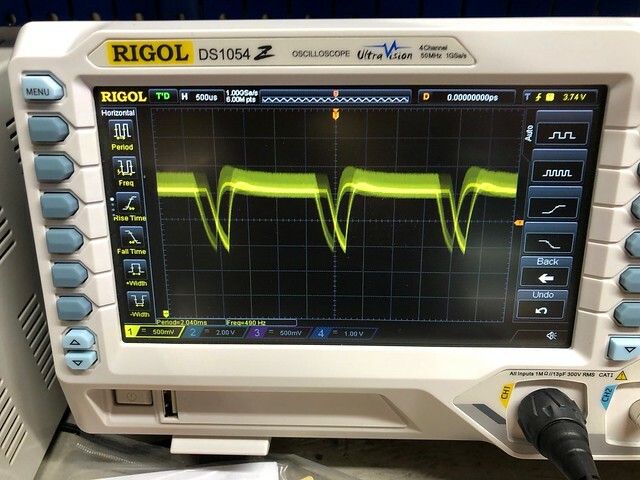 I was running PWM on some high power LED arrays in the past, they sure do make a whining noise, I suppose if the square waves rise too quickly it could be something to be concerned about, but I doubt they do. 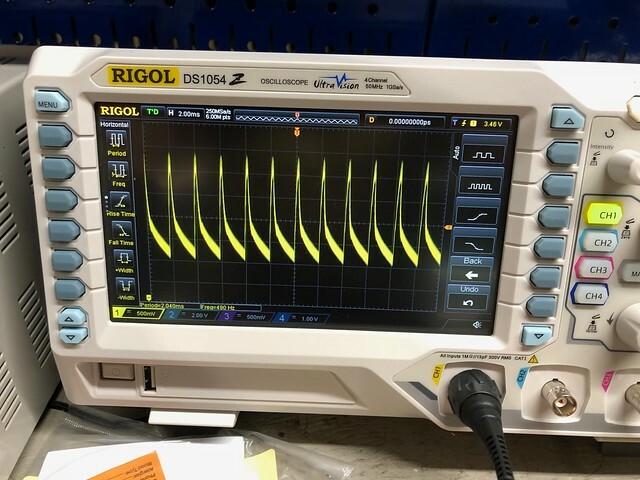 Has anyone here put an Oscope on a PWM output under load to see what they characteristically do? Ok, I just noticed something interesting. The whine I'm hearing from the laser diode is not coming from the diode. It's coming from the block of wood I'm using as a beam dump. I moved my LPM into the beam and the whining stops. I would still love to know if this causes any more stress on the diode. No wonder it's whining. You have your PMW frequency set to 400 Hz. I built one at 2.4 kHx. No problem listening to it whine at that frequency. The diode is fine, it can handle PWM no problem, as long as the peak current isn't above the safe current for that diode. The whine is from the laser burning/heating the surface of the beam dump each time it turns on. Can hear the same thing real good with my Q-switched laser, especially when focused to a point, as it ablates whatever it's focused on. That results in a small "pop" every time the laser fires. If I recall correctly, your Q-Switched Nd:YAG switching frequency is 1 Khz, diachi? As long as these frequencies are in the range of normal hearing, they will sound somewhat like a buzz or whine. Why is your second waveform only 1Vpp? What does it look like without a load connection? Please don't put a capacitor on PWM output directly. PWM is an AC signal with a DC offset, and caps pass AC. This is effectively shorting the pin to ground, and while the arduino can probably handle it, it is bad practice to short outputs. It will also act as a peak-hold feature rather than a filter. Ok, I just noticed something interesting. The whine I'm hearing from the laser diode is not coming from the diode. It's coming from the block of wood I'm using as a beam dump. As in it being a problem for the laser diode: probably not, though i'd prefer doing the PWM at a higher frequency: if it's a handheld laser you'll sort of see a dash-dot-dash-dot pattern if you sweep the beam quickly across a wall. For projectors it would be a total disaster since the pwm frequency is lower than the scanner needs to be able to change it's intensity. Huh?! Wonder where I got 1000 Hz from? Oh, well. I think you need to send it to me. I will see what I can do to get the switching frequency up a bit. Black targets work better. Lower duty cycle higher power works better. Larger spot on softer material such as fabric or paper works better. Ablation isn't necessary - thermal expansion/oscillation is sufficient, and ostensibly more efficient. If i printed some paper with black from my laser printer, what would be a good dutycycle and frequency to produce some audible effect? Also, is there a certain amount of (peak) power required to get this effect at all, or is just less loud with lower power, and could it be done with something like a 200 mW red? The odd thing is i've noticed audible feedback from targets with pretty low power levels (like 100-200 mW, 650 nm) but never been able to reproduce them reliably. Black paper would be a decent target I think. The effect is consistent with my ~1.5W blue in medium and low modes. Low mode is somehow louder than medium, with PWMs something like 10% and 50% respectively. My best guess is that a shorter PWM has higher frequency components (according for Fourier theory) and with the several-hundred Hz that is standard PWM, the KHz harmonics of the thermal expansion would be more audible than the fundamental frequency. That's just a guess. 200mW red? I'd say defocus to 1cm, set the PWM to 50% at 2kHz, point it at the black paper with your ear just behind the paper. Alter the frequency and spot size. You should hear something eventually. I might try it this weekend if I can find my old 200mW reds. Getting a 1-2 watt 445 to modulate would not be much of a problem either, if that's sort of 'guaranteed to work'. If there is a certain amount of power required that'd be nice to know. But you suggest defocussing the laser so it will not burn the target at all - which is interesting since i presumed the audible noise was actually produced from sudden releases of burst of gas from lasers smoldering away the target. Perhaps that idea was entirely wrong and it's just thermal expansion from the target changing temperature rapidly even at lower temperatures. If you can get it to work reliably please share the details and a video of the setup if possible.